New York City is the media capital of the world but there is insufficient online reporting on what’s happening in local Manhattan communities. Thus, DNAinfo primary business goal is to provide hyper-local, neighborhood news. When DNAinfo first came to DPCI for help, the company was using a custom-made Web content management system that was built upon an esoteric technology platform with very few people in the United States that had any expertise in working with it. DNAinfo’s editors and reporters complained that the system was slow and prone to error, with an unintuitive interface that was not designed with the workflow needs of journalists in mind. In addition, functionality that was long ago retired or never used was left in the system, causing clutter and distraction. As a result, it was time-consuming and cumbersome for staff members to accomplish even the simplest editorial tasks. According to DNAinfo editorial staff, the Web content management system did not provide functionality to identify who was working on a story or where a story was in the workflow. It allowed multiple users to edit the same story at the same time, often resulting in double-work as one user’s changes would overwrite another’s. DNAinfo editorial staff often had to resort to shouting across the news room to find out the status of a story or to warn other staff members that someone else was currently editing the content. Editors and reporters also found it difficult to find images and multimedia files for use on the Website. Images and multimedia files were not stored in a logical or organized structure, which made it tedious to browse or search the archive. 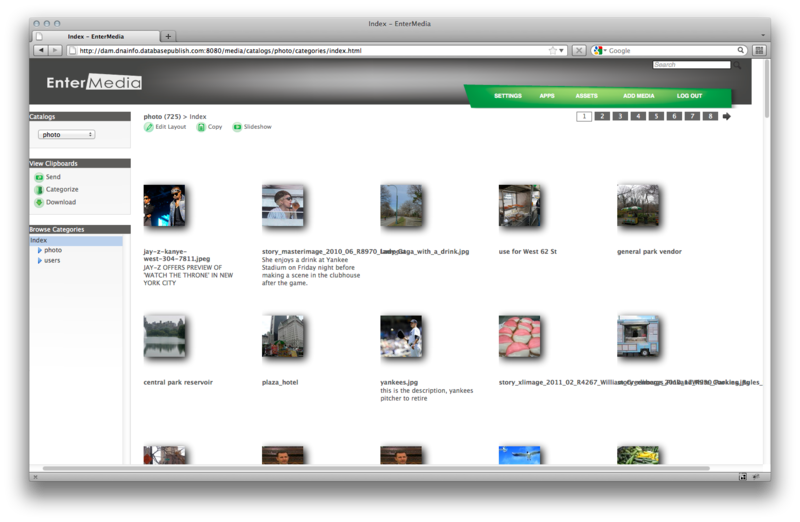 Editors and reporters had to search for images by filename and the search results did not include image thumbnails for easy identification. This cumbersome process of searching for and adding digital assets to a news story slowed the publishing workflow and caused many editors to work around the system by keeping copies of frequently used assets on their individual hard drives. Editors would then upload their local copy of an image to the Web content management system each time they needed to use it on the Website. This led to multiple copies of the same exact image in the Web content management system. DNAinfo management realized that as the company continued to grow, so would the usability, scalability and stability issues with the incumbent Web content management system. DNAinfo management considered adopting an Open Source Web content management system that would not only reduce software and maintenance costs, but would provide a large community of development resources, modules and plug-ins to choose from. As part of this Web content management system migration, DNAinfo management also wanted to improve the editorial user experience for authoring news stories, adding multimedia and curating content for specific pages. DNAinfo management hired DPCI to help design and implement the next generation digital newsroom using Drupal, an open-source Web content management system. DPCI provided Drupal consulting services to design a solution that would meet DNAinfo’s needs. DPCI started with an analysis of the current editorial workflow and met with management, editors, reporters and creative staff to elicit functional requirements for the new platform. DPCI recommended integration of Drupal with EnterMedia, an open-source digital asset management system, via the EMBridge module to provide enhanced digital asset upload, search and retrieval functionality within the Web content management environment. Once the functional requirements were validated and approved by DNAinfo staff, DPCI translated the requirements into technical specifications including system architecture, identification of core and contributed Drupal modules, existing module enhancement, custom module development, user interface design and EnterMedia configuration requirements. Next, DPCI’s Drupal development team followed the technical specifications to build DNAinfo a sophisticated digital news room platform. DPCI staff subject matter expertise in editorial workflow management systems helped in designing and developing an editor and reporter-friendly user interface. DPCI staff gave special attention to the layout of content fields, making sure that the primary article story fields (Headline, Teaser and Body) were in constant view while the user added story metadata, picked images and added multimedia. DPCI designed a “Quick Publish” interface for developing stories with the minimum number of required fields and objects, so that DNAinfo editors and reporters could quickly create a breaking news story without distraction. 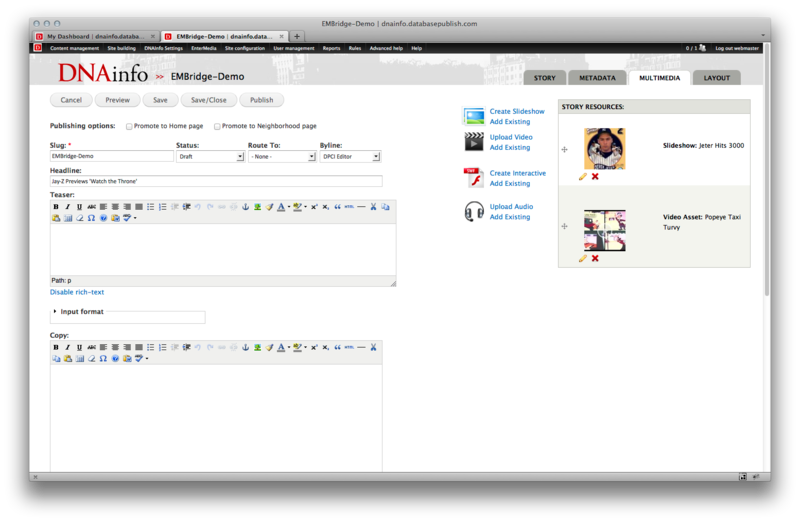 DPCI developed a status-based workflow system within Drupal to manage all of the newsroom content. 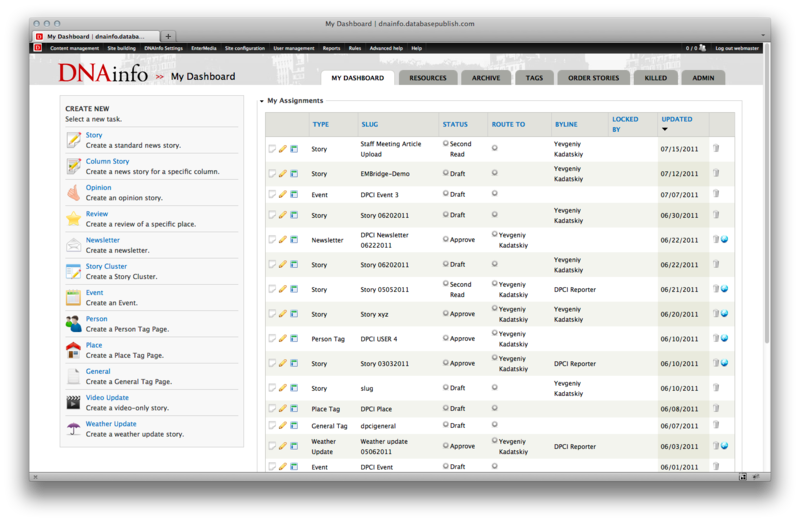 Reporters and editors route stories to each other and these assignments appear on the editorial dashboard. 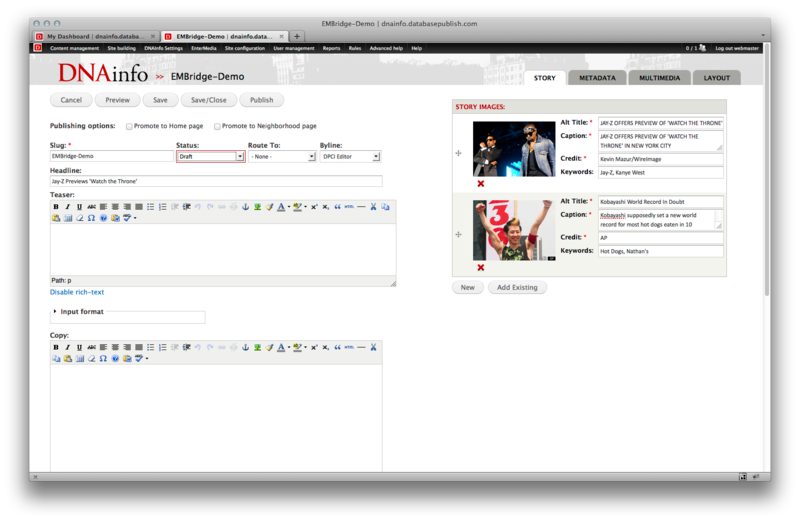 The dashboard gives reporters a shortcut to access all of their article assignments and allows editors to see at a glance the status of all stories in the publishing workflow. DPCI implemented EnterMedia as the digital asset management system that would store all of dnainfo.com images and multimedia assets. DPCI then implemented EMBridge, a Drupal module that extends the Drupal image management functionality through integration with EnterMedia. By using EMBridge, editors and reporters have access to all of the features and benefits of the EnterMedia digital asset management system such as XMP metadata extraction, automated asset transformations and file versioning, without ever leaving the Drupal content creation interface. Drupal references the assets stored in EnterMedia, allowing DNAinfo to maintain a single source of truth digital asset archive that can be utilized by other systems and applications in the future. DNAinfo launched a new version of www.dnainfo.com powered by Drupal and EnterMedia in July of 2011. The rollout of the new Web content management system was well received by DNAinfo staff. Management and editorial staff confirmed that the ease of use and intuitive nature of the system made for an easy transition. “The new content management system rollout was the best technology release I have ever experienced”, said Leela de Kretser, Editorial Director and Publisher at DNAinfo. In addition, editorial staff at DNAinfo found that the new platform reduced the time spent uploading, searching for and selecting digital assets and enabled them to publish news stories more quickly. “The new content management system has allowed us to do our work faster. Editors can now focus on writing and enriching stories, rather than spending time fighting with an inefficient system,” saidJim Scott, Senior Editor at DNAinfo. With DPCI’s help, DNAinfo now has a stable and scalable digital newsroom to help position the company as a leader in reporting local news to Manhattan communities. “From guiding us through the requirements phase and developing the system, to helping manage the initiative, DPCI has been a great partner for us. The new content management system implementation was a huge project that has been a major success. I now have the peace of mind, knowing that our infrastructure is stable and scalable,” said Marque Staneluis, Senior Director of Technology and Product Development at DNAinfo.